The Kirkwood is held each June at the Stowe Country Club. 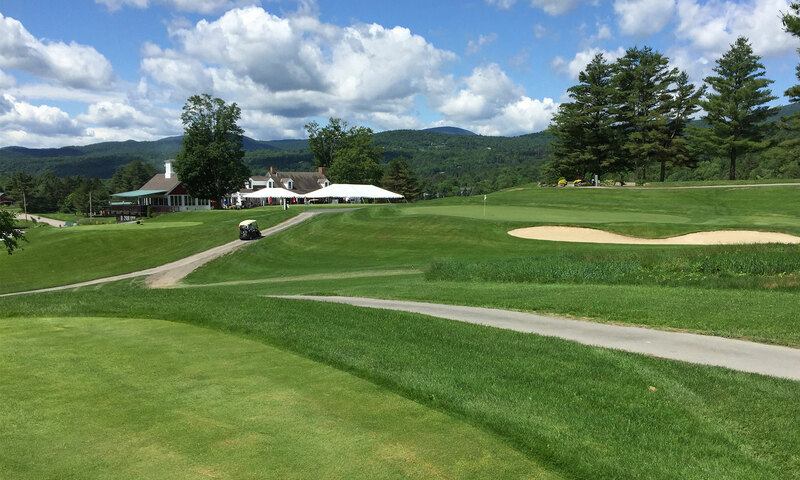 It is one of the finest amateur four-ball, match-play competitions in New England. For the last 9 years of his life Joe Kirkwood was the Head Professional of the Stowe Country Club. His legend, character and spirit still inhabit Stowe Country Club; this is never more apparent than during the 4 days in the early summer when friends from across the country, as well as around the world, come together to celebrate his life the way he would have wanted . . . by playing a little golf. Fittingly, the Joe Kirkwood Tournament benefits Stowe Junior Golf. Stories still survive of Joe playing 4 holes with one club against the junior golfers, the winner getting a shiny new golf ball for their efforts. Our Junior program provides over 100 kids between the ages of 7 and 14 the opportunity to learn the game through an 5-week instructional program. For years, the Kirkwood has sponsored junior golfers at Stowe Country Club. There are lots of new things for this year, but it is important that we keep the great traditions. Reviewing the comments from the past few years, it became overwhelmingly clear that the tournament needed to be updated to maintain viability, The biggest thing was to shorten the tournament to three days. As much as the qualifying round on Thursday was an important part of the Kirkwood in the past, dropping it was key to moving to a shortened three-day format. This year we will seed the flights using your individual handicaps listed on your application. We will place teams in flights of eight by the total of the two indexes. The lowest sixteen teams will become the championship and first flights. These sixteen teams will play an 18-hole shotgun on Friday morning. The scores will order the teams for the championship flight (teams 1 to 8) and the first flight (teams 9 to 16). The match play tournament will begin Friday afternoon with a shotgun for all flights. Teams advance in their flight brackets on Saturday with matches using tee times. The winning teams will compete on Sunday morning for flight championships and consolations. All the remaining teams will play Sunday morning in a “Last Chance” event. The Kirkwood Champion will be the winner of the Championship Flight. The Kirkwood Committee has made these changes to enhance the competition and challenge in the tournament while keeping the essentials of fairly qualifying teams and keeping match play the core format. One of the biggest new additions is the Sunday Shootout. We are taking the winners from each flight and the Last Chance tournament winner and putting them into a sudden-death shootout on Sunday before the Awards Ceremony. The key piece to the shootout is that each team is playing for their flight and the other teams in that flight will share in their success. The Sunday Shootout prize pool will be divided amongst the teams from the winning flight. Another new feature of this year’s tournament is that we are asking everyone to chip in $25 to a prize pool. This money will be divided in half. Half of the money staying in the flight and going the winner. The other half is going to the Sunday Shootout. Please selected either individual or team registration and complete the form through checkout. Remember to also add The Package and any Guest for the Evening Reception to your shopping bag prior to checking out to save some time at the registration desk.